It's the worst storm in twenty years. School is out early and it's home for Teddy and his younger brother, Ronnie, in from the cold and wind, with smells of corn bread and chili cooking. The snow never stops. Soon the stranded travelers start to arrive. Neighbors and old friends trudge to the door and are welcomed inside. When the electricity fails, there are candles and it is warm by the stove. The evening turns into a party of riddles and stories until it is time to bed down for the night. This is a charming story of life in the country, of neighborliness, of friendship and helping out in time of need. Marshall County schoolteacher Marc Harshman debuted as a children's book author last year with "A Little Excitement," published nationally by the Cobblehill division of Dutton Books. 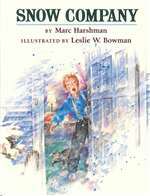 Harshman is back with a second children's book with the same publisher, called "Snow Company," illustrated by Leslie W. Bowman. 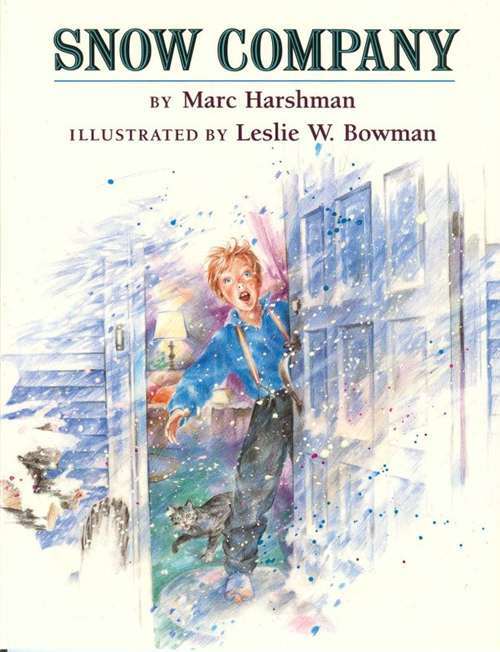 It tells about the worst snowstorm in 20 years, much to the delight of Teddy and his younger brother, Ronnie. Schools close and the brothers race home to corn bread and chili cooking in the kitchen. Then, stranded travelers begin arriving at the house including their father's old schoolteacher and a local woman with her baby. "When the electricity fails, there are candles, and it is warm near the stove. The evening turns into a party of riddles and stories about blizzards until it is time to bed down for the night." Marc Harshman is the poet laureate of West Virginia. His full-length collection, GREEN-SILVER AND SILENT, was published in 2012 by Bottom Dog Press. His fourth chapbook, ALL THAT FEEDS US: THE WEST VIRGINIA POEMS came out from Quarrier Press in 2013. Periodical publications include Shenandoah, The Georgia Review, The Progressive, Appalachian Heritage, and the Roanoke Review. Poems have been anthologized by Kent State University, the University of Iowa, University of Georgia, and the University of Arizona. His eleven children’s books include THE STORM, a Smithsonian Notable Book. His children's titles have also been published in Spanish, Japanese, Korean, Danish, and Swedish. Marc has new children’s books forthcoming from Roaring Brook/Macmillan and Eerdmans. He lives in Wheeling, West Virginia and holds degrees from Bethany College, Yale University Divinity School, and the University of Pittsburgh. He has also recently received an honorary doctorate from Bethany College in recognition of his life’s work. In honor of West Virginia’s Sesquicentennial, Marc was commissioned by the Wheeling National Heritage Area to write a poem celebrating this event and so on June 20th his poem “A Song for West Virginia” was presented in both Charleston and Wheeling as a part of the day-long festivities held that day.